This graph was drawn with the help of my daughter Kathryn on her “take your daughter to work” day in Year 10 at school. Her skill with spreadsheet programs was invaluable! 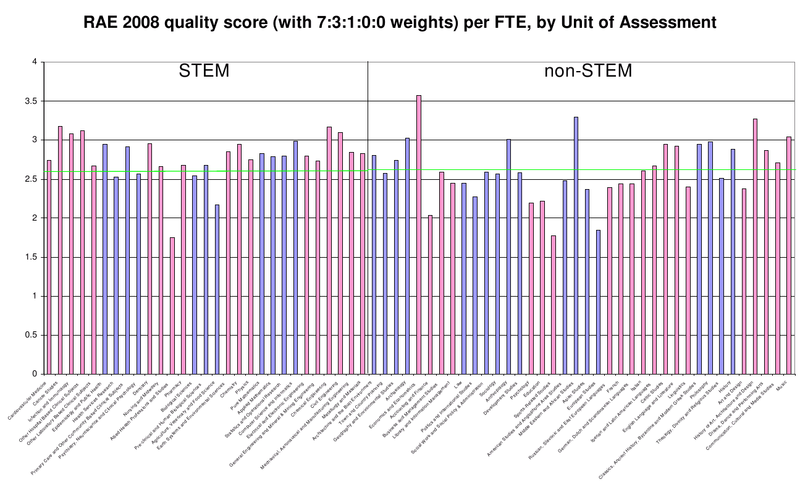 The graph shows how different disciplines — that is, different RAE “sub-panels” or “units of assessment” — emerged in terms of their average research quality as assessed in RAE 2008. The main data used to make the graph are the overall (rounded) quality profiles and submission-size data that were published in December 2008. Those published quality profiles were the basis (in March 2009) of ‘QR’ funding allocations made for 2009-10 by HEFCE to universities and other institutions. Each bar in the graph represents one academic discipline (as defined by the remit of an RAE sub-panel). The blue and pink colouring shows how the sub-panels were organised into 15 RAE “main panels”. A key task of the main panels was to try to ensure comparability between the assessmenta made for different disciplines. Disciplines within the first seven main panels are the so-called “STEM” (Science, Technology, Engineering and Mathematics) subjects. where the p’s represent the department’s RAE profile and the w’s are suitably defined weights (with w4 ≥ w3 ≥ … ≥ w0). The particular weights used in constructing such a quality score are rather arbitrary; here I have used 7:3:1:0:0, the same weights that were used in HEFCE’s 2009 funding allocation, but it would not make very much difference, for the purpose of drawing this graph to compare whole disciplines, to use something else such as 4:3:2:1:0. The average quality score over the whole RAE was about 2.6 (the green line in the graph). HEFCE relies heavily on the notion that assessment panels are able to regulate each other’s behaviour, so as to arrive at assessments which allow disciplines to be compared (for funding purposes at least, and perhaps for other purposes as well). This strikes me as wishful thinking, at best! By allowing the relative funding of different disciplines funding to follow quality scores so directly, HEFCE has created a simple game in which the clear incentive for the assessors in any given discipline is to make their own scores as high as they can get away with. The most successful assessment panel, certainly in the eyes of their own colleagues, is not the one that makes the best job of assessing quality faithfully, but the one with the highest scores at the end! This seems an absurd way to set up such an expensive, and potentially valuable, research assessment exercise. Unfortunately in the current plans for the REF (Research Excellence Framework, the RAE’s successor) there is little or no evidence that HEFCE has a solution to this problem. The REF pilot study seems to have concluded, as perhaps expected, that routinely generated “bibliometric” measures cannot be used at all reliably for such inter-discipline comparisons. Since I don’t have an alternative solution to offer, I strongly favour the de-coupling of allocation of funds between disciplines from research quality assessment. If the Government or HEFCE wishes or needs to increase its funding for research in some disciplines at the expense of others, it ought to be for a good and clear reason; research assessment panels will inevitably vary in their interpretation of the assessment criteria and in their scrupulousness, and such variation should not be any part of the reason. This entry was posted on 2009-11-25 at 16:16 and is filed under Research Assessment, UK parochial. You can follow any responses to this entry through the RSS 2.0 feed. You can skip to the end and leave a response. Pinging is currently not allowed. Next time Kathryn would like some work, it might be interesting also to construct the graph using only Russell Group universities. This is not to suggest that research done in one place is better than another; it is to control for any possible “institution” effect. Another possible criterion would be only to consider institutions which submitted to more than N units of assessment, for some N. This would eliminate from the comparison some excellent “specialist” institutions, such as LSE. Thanks, that seems a good idea. Kathryn is too busy at present with more important work (her GCSE exams! ), but I’ll see if I can “Russell up” something on this myself before too long.